Isn’t it great how old tech can be repurposed? is now a state-of-the-art RoboCall Receiving Device! (Just to clarify: this is me being snarky. It’s either that or punch a very large hole in my wall after receiving the same automated phone call on our old landline phone five to ten times a day for the last three months! Evil is real. It lives in a computer and has a phone! 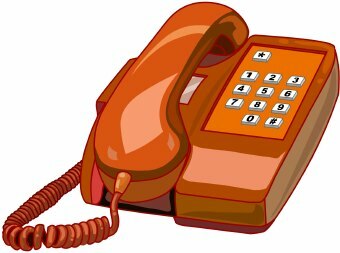 Survey: Do you still have a landline? If so, when was the last time you received a call from an actual human being (other than your mother)? This entry was posted in Culture, Humor, Mitchellaneous and tagged annoying, automated, funny, landline, phone, robocall, solicitor. Bookmark the permalink. Hilarious! Yes, we have a landline and yes I get at least 10 automated calls per day! Most of the time there is nothing but silence on the other end when I pick up, but we also get health insurance calls and one from Google about a business listing we don’t even have. I usually only talk to my wife or my Mom on the landline. When I was a kid in the 80s all we had were corded phones. I still remember when the extra long cords came out. We thought it was so cool how far we could walk around! 🙂 God bless! Yeah, I get the silent robocalls constantly; I hang up after saying hello twice. But the ones that are driving me (extra) crazy are the automated messages from a certain energy supplier claiming to be our local power company (they’re not); same message, sometimes as many as five times in 15 minutes! Google, eh? Oy! We get calls every now and then with offers to help us sell our time-share condo (which we sold over 30 years ago). Bless you back, Ryan! I think I saw that on an old Twilight Zone episode. Ha! You crack me up. My son is in his 20’s and he is puzzled by our land line. He says it’s just like a having a special phone for the robots to call. I think that might be right. We don’t even get real people trying to sell us stuff, just recordings and robo calls. Really funny, there’s a phone on the wall at church and I often invite kids to use it, but they really don’t know what it’s for. One kid actually called his grandma who lives three states away, because hers was the only phone number he knew. Strategic OPPs = Old People’s Phone operation. Gave up my land line 4+ years ago. Then I gave up my CenturyLink internet about a year later. Guess what, the evil robocallers have my cell phone number and donotcall.com doesn’t work like the government said it would. They exempted themselves for political campaigns. Ugh! All is well though. I’ve just dropped DirecTV in favor of internet streaming TV services. It’s been months since I turned on DirecTV so I canceled it. Rates going up again. I get good enough internet to stream a couple of TVs at a time. Aha, the solution is telepathy! But then, the thought of receiving robocalls directly to my brain is pretty terrifying. Yes, there is a landline in the house. Same problems as yours, and now my cell service is becoming the same pain in the fatootie. I no longer answer numbers I don’t recognize. If it’s important, the caller will go to voicemail. We have a red, push button phone hanging on the wall in the kitchen. It has become a conversation piece. That’s hilarious. We gave up the landline seven years ago and haven’t missed it at all. Although I am noticing more and more robocalls now on my cell phone, which is annoying. Yep. Cell robocalls more avoidable, for now. But that will change soon, I imagine. Still have a landline. Only a handful of people have the # so 99% of the time it rings it’s a robo call. Besides,if I don’t recognize the # I don’t ever answer it. Still,the calls keep on a coming though. We still have a landline but my children are the only ones who use it…and they only use it to call me on my cell phone! Oh, may they please bring back the Do Not Call List! PLEASE! Was it ever that successful? Seems like when we added ourselves to that list our solicitation calls only dropped a bit. The downside of living in an uncharted region where “there be dragons,” eh? Really? We did that some years back, and it didn’t seem make much of a difference. Still, I’m willing to try again. Where do I go, Valerie? Call this number from each line you want on the Do Not Call Registry: 1-888-382-1222. It may take 30 days for them to stop. After that time if you have a problem, you can register your complaints with the Do Not Call Registry. Business phones can not opt out. Best wishes to help you get the madness stopped! 🙂 #saynotorobocalls! I’ve had the same land line for the past 40-plus years. I rarely receive robo calls or junk calls. My sister and other relatives call me regularly on it. My boyfriend and I chat on it a few times a week. I guess I must be a slow converter because I didn’t move up from dial-up Internet until six-years ago. I am in the process of phasing out my flip phone and have finally purchased a smart phone. This is odd because in every other way, I’m very progressive. Yes. Today from the Doctor’s office. I do have a landline that is an unlisted number. I don’t get calls. My parents call me on my cell. Hmm, I take it you pay a fee to be unlisted? Yes, I do pay a fee to be unlisted and if I call anyone, my number is shown as private call. They called me this week. I pressed 1 to speak with a live person and explained that I was busy trying to repair a “hyper-stabulic super- ethereal transdimensional tribold converter and that the thingamabob kept falling off the hootenanny. He hung up on me. Still have a landline. I have a cell phone as well. Living in a rural area it’s good to have so they can locate your house if there’s an emergency or you still have phone access if the power goes out for a long time. We do get some junk calls but not too often. Our family usually calls by landline. The rural life really is different in many ways, isn’t it. It is. It’s not for everyone but I love it.